Diamond Jewelry is elegant, fine, and uniquely worn by people of all walks of life. Its history is recorded as being worn and valued as far back as ancient times, yet, this jewel has only been made public in the last 150 years. In the past, these jewels were worn exclusively by royalty. The earliest known period for diamonds placed in a jewel setting dates back to the Norman Invasion of England; one of the Arpad Kings of Hungary Andrew I, had a crown for his queen, set in rough-cut diamonds. However, the rough-cut diamonds were no longer available in this region for another half-millennium. By the mid-1500s, many events were happening, both King Henry VIII of England and Martin Luther of Germany had broken with the Church of Rome; Russia was expanded to its present- day borders by Ivan IV (Terrible); and Suleiman, the Ottoman sultan extended the Turkish empire far west to Vienna. In such time of those events, the first diamond-cutters' guild formed in Antwerp, in present-day Belgium. Soon an industry developed, giving birth to the modern diamond jewelry market, for the purpose of appraising loose diamonds. Today, Antwerp is still the center of the international diamond jewelry trade. Diamond Jewelry consists of diamond bracelets, earrings, necklaces, rings and their settings. The diamond bracelets come in various styles and go perfectly with most fashions, i.e. clothes, shoes, hats, and so on. The bracelet goes as far back as 5000 BCE in Egypt. In the beginning, bracelets were made from materials like bones, stones and woods for religious and spiritual interests. One of Egypt's most recognized symbols is the Scarab Bracelet, fore, it represents rebirth and regeneration. The Scarab was carved, worn as jewelry and wrapped into the linen bandages of mummies. The Azabache Bracelets in Latin America, were worn to protect against the Mal de ojo or the evil eye. The evil eye is believed to be an excessive admiration or envious looks by others. Martenitsa tradition in Bulgaria, involves tying a red and white string around the wrist to please Baba Marta (a mythical figure called, "Grandmother March") to make spring come sooner. And in some parts of India, bangles are worn to denote a woman's marital status. These are just some examples of religious and spiritual beliefs in different culturals around the world. Diamond bracelets made like the tennis bracelet, were popularly worn by tennis stars like Serena Williams, Gabriela Sabatini, and Diana Kerrison. Chris Evert first wore the in-line thin diamond bracelet that features a symmetrical pattern of diamonds, at the U.S. Open. Chris is the former World No.1 woman tennis player and 18 Grand Slam singles title winner. The "tennis bracelet" got its name from the incident when Chris Evert's in-line thin diamond bracelet, made by jeweler-to-the-stars George Bedewi, accidentially broke while Chris was playing in the U.S. Open, the match was interrupted so, that she could recover her precious diamonds. This new name for the bracelet sparked a huge jewelry trend. Other types of bracelets are: sports, charm, bangles, slap, beaded (that you can make yourself), links and karma bracelets. Diamond Earrings as a fashion accessory also have quite a history of being mostly worn by the mature women in different communities. You can trace earrings back to almost 5000 years in Asia where 2 original styles were the hoop and pendant. The oldest known examples of the earring were discovered by Archaeologists working in Iraq, which were dated back to 2500 B.C., and earrings were found in Crete which dated back to 2000 B.C., they were gold, silver and bronze hoop earrings. Earrings were worn through out the ages as a fashion for the clothes or based on the hair-style people wore according to their tastes or timeline of their fashions. Diamond earrings come in different styles and shapes such as: studs, rounds, shared prong drop clusters, men and women styles, hoops and more. 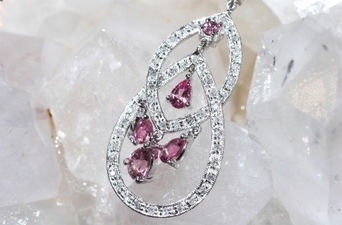 Diamond necklaces, also known as pendants, highlights a woman's beauty. They are the diamond jewelry people have had affairs with throughout history. A necklace made of diamonds can truly overwhelm the owner to the point of obsession. There have been at least one person who were so fascinated by this diamond jewelry, until, they would steal it from the owner. Fore, there were many stories written about these thefts of diamond jewelry, especially necklaces. 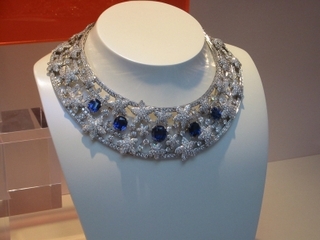 A short story was written about a diamond necklace by a french author named, Guy de Maupassant. The story called, "The Necklace or The Diamond Necklace", was first published in this French newspaper called, Le Gaulois in 1884. This story had become very popular because of its twisted ending. It was an inspiration for the short story called, "Paste", by Henry James. Later, a musical was composed dramatising the story, by the Irish composer Conor Mitchell. It was first professionally produced by Thomas Hopkins and Andrew Jenkins for Surefire Theatrical Ltd, in 2007 at the Edinburgh Festival. The story, "The Necklace", has nothing to do with theft, as other stories written about diamond necklaces, it is about a woman and her husband. The woman's name is Madame Mathilde Loisel. As a little girl, Mathilde imagined herself in a high social position with wonderful diamond jewelry. However, when she grew up, she married a lowly clerk and she had nothing. To shorten the story, Mathilde borrows the fanciest jewel necklace from her friend, Madame Jeanne Forestier, to wear with this dress she bought for this party. Mathilde and her husband goes to this high society party given by the Ministry of Education, and she loses the necklace. Mathilde and her husband looked everywhere, but, could not find the necklace. Their generous friends loaned them 36,000 francs to purchase a necklace that looked just liked the lost necklace and had to worked for 10 years to pay back the loan. They lost everything, Mathilde had to work and her husband worked two jobs. Later, Mathilde saw Madame Forestier and told her the necklace she returned was actually a replacement. Suprised, Madame Forestier tells Mathilde the original necklace was a fake and worth only 500 francs. Diamond rings and their settings dates back to prehistoric times of the cave men and women. 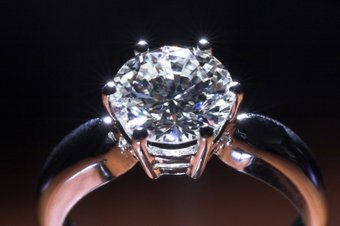 The engagement ring predates the discovery of diamonds by one or two eras. The rings were common among the ancients in Greece and Egypt. Rings are symbols of fidelity in civil engagements and love between two people. The settings of the rings reflect the eternal nature of your commitment in the relationship with your significant other. Normally, ring bands are made of gold (yellow, rose, or white) or platinum and not silver. Ring bands made of silver tend to tarnish with age and its not ideal as an engagement ring for the person you love. 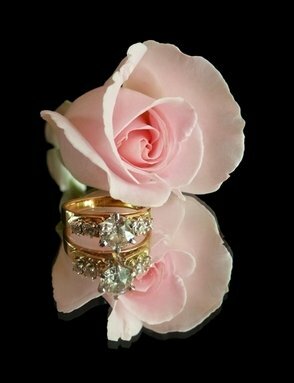 The ring band made of gold is measured by carats, 24 carats of gold is pure. Most gold bands are 14 to 18 carats, these numbers represents 14 or 18 parts gold alloyed and 6 or 10 parts of some other metal. Until World War I, platinum has been used for engagement ring settings, it was very popular back then. Today, platinum is popular again in engagement ring settings, estimates as high as 30% of platinum is being used to make them. These are just some of the diamond jewelry that are popular purchases by the consumers.